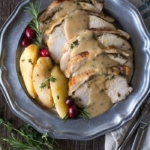 Fresh Herb Crockpot Turkey Breast with Brown Butter Pears is perfect for a small Thanksgiving dinner group. My family isn’t really shrinking they are just disappearing which makes holiday gatherings smaller and smaller. Our family has scattered across the globe in the past few months. Singapore, Sweden, and Colorado have become their new homes. While one son and daughter-in-law remain close by we have to adjust the quantity of our holiday feast. Using a crockpot or slow cooker frees up the oven for baking rolls and pies that I want to serve fresh and hot. 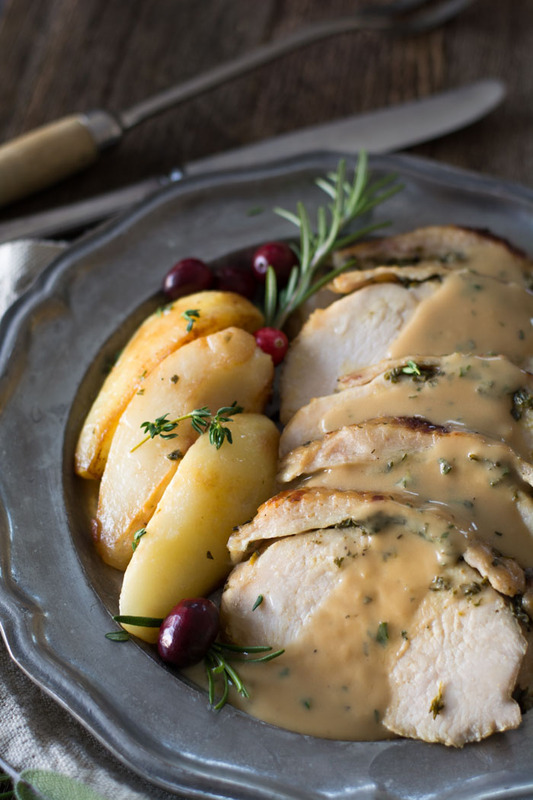 Fresh herbs and brown butter pears make a simple crockpot turkey a gourmet meal. I have broken the recipe down into segments that can be made ahead of time, which helps with meal prep. You will need fresh parsley, sage, thyme, and rosemary. 1/2 cup butter and 1/4 teaspoon nutmeg. Chop 3 tablespoons of parsley, sage, and thyme and 1 tablespoon fresh rosemary. 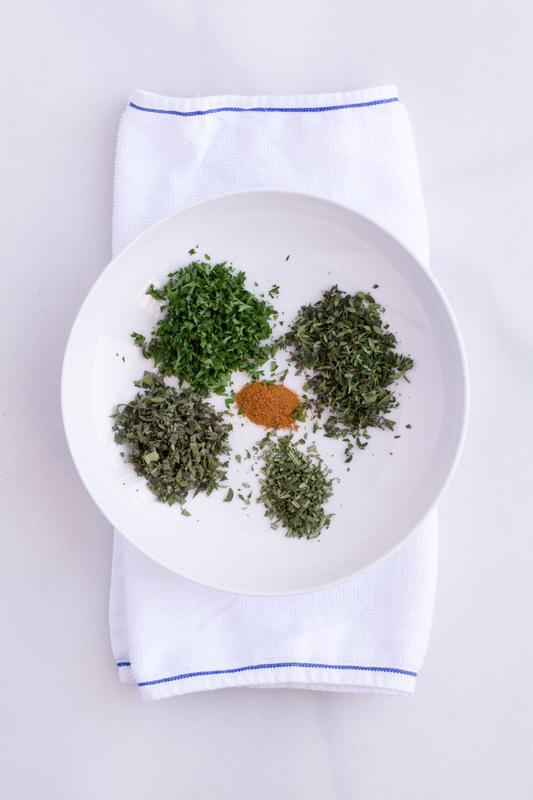 Combine fresh herbs and 1/4 teaspoon nutmeg. Reserve 2 tablespoons of the mixture to add to the gravy. Mix remaining herbs into softened 1/2 cup butter. Set aside while preparing turkey breast. Purchase a boneless, skin-on turkey breast. I have a local grocer that removes the breast from a large turkey and keeps the skin intact. I like an all natural breast that has not been preseasoned or brined. Carefully lift the skin from a 3 1/2 – 4 lb turkey breast. 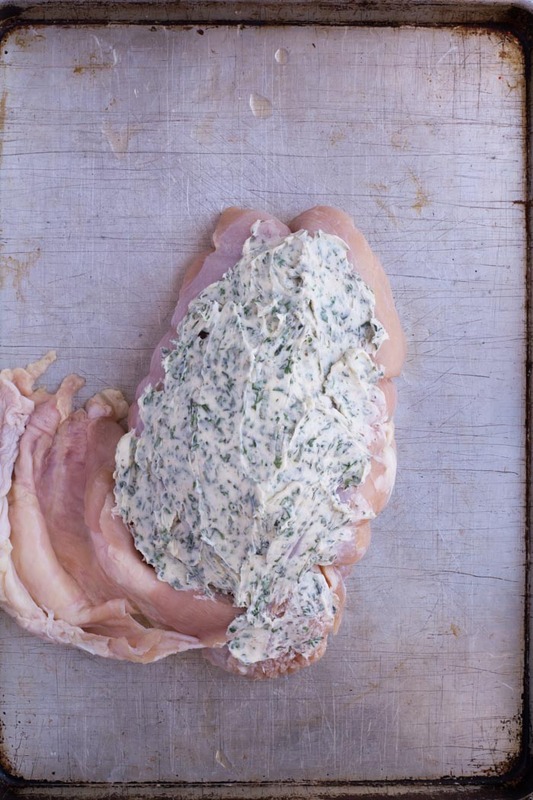 Spread the herb butter over the breast reserving 2 tablespoons for the outside of turkey. Cover with the skin flap, rub remaining herb butter mixture on top and underneath the breast. Tie the skin on with twine or string. To the bottom of a crockpot and 1 peeled carrot, 1 onion cut in half, and 1 pear cut in half, along with a few sprigs of parsley and thyme. Place turkey breast on top of veggies and pears. Cover with a lid and cook on low for 4-6 hours (depending on the size of the turkey breast) or until internal temperature reaches 160-165F degrees. An instant-read thermometer comes in handy for testing the temp. 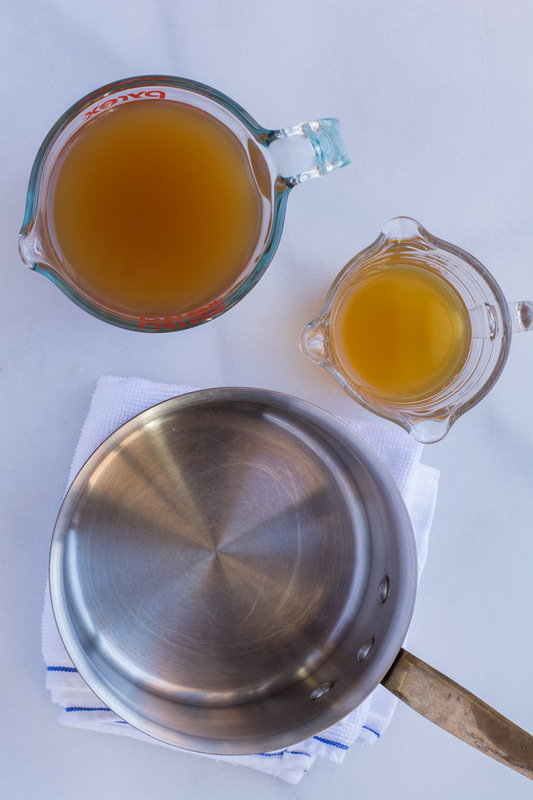 In a saucepan combine 3 cups turkey stock or turkey bone broth with 1/2 cup fresh apple cider or juice. Simmer until the mixture has reduced to 2 cups. This can be made in advance and refrigerated for a few days. One the turkey has reached 160-165 degrees, remove from crockpot and allow to sit while making the gravy. Letting the turkey sit before carving allows the juices to settle in the meat and not run out while carving. Remove turkey from crockpot and allow to sit. Pour the liquid and solids that remain through a strainer. Discard solids. Carefully remove as much of the fat/butter that you can and reserve. In a saucepan, add 1/3-1/2 cup of fat/butter. Stir in 1/3 -1/2 cup flour depending on how thick you like your gravy. I like my gravy on the thin side. Stir together and cook for a minute or two to cook the flour taste out of the mixture. This step can actually be made while the turkey is cooking and set aside. 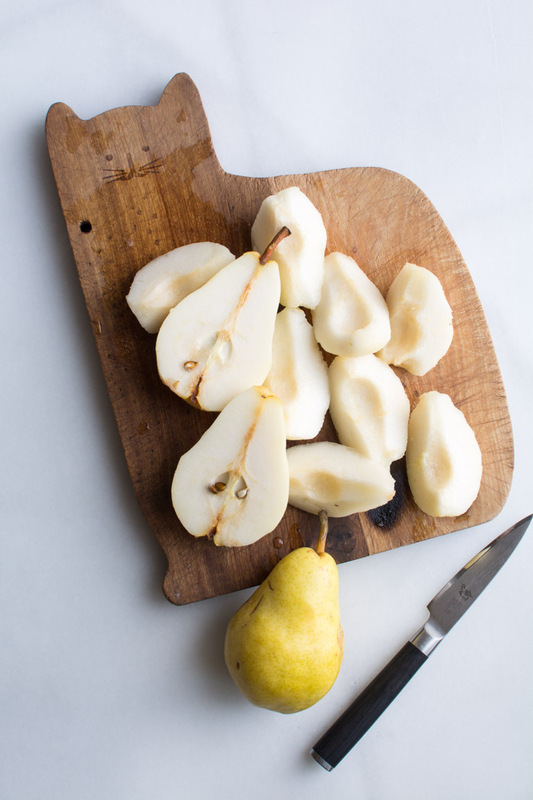 Peel, core and cut pears into quarters. 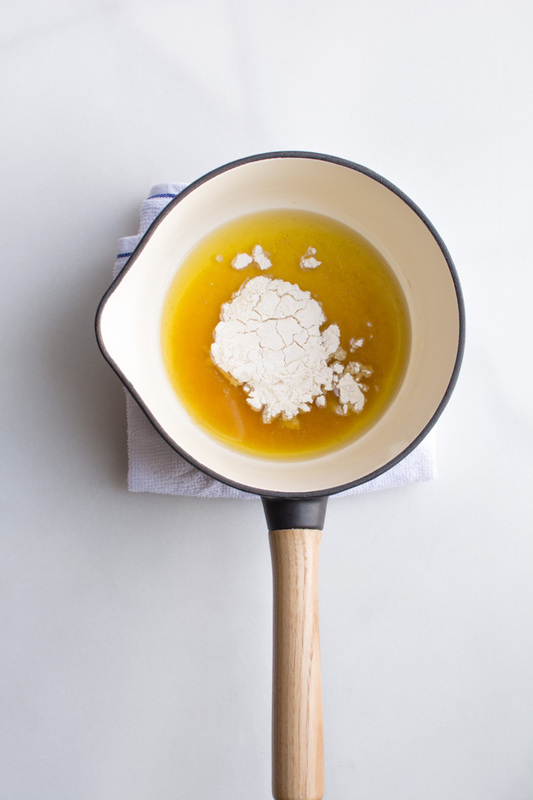 Add 3 tablespoons butter to a saucepan and melt over medium/low heat. Add the pears and brown on all sides. 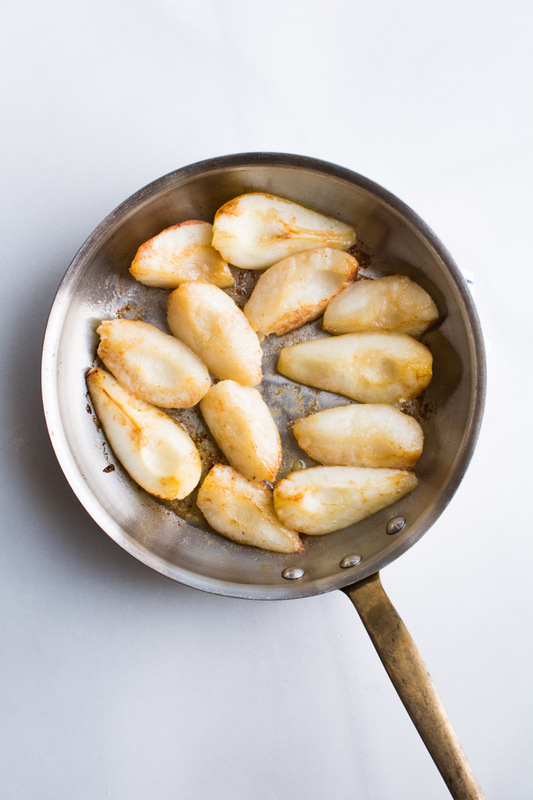 While the pears are sauteeing the butter will begin to brown and caramelize the pears. Cooking a turkey in a crockpot does not crisp the skin. If you like a nice crisp skin, place turkey on a baking sheet and place under the broiler for about 5 minutes. I use the lowest rack in my oven and watch carefully. 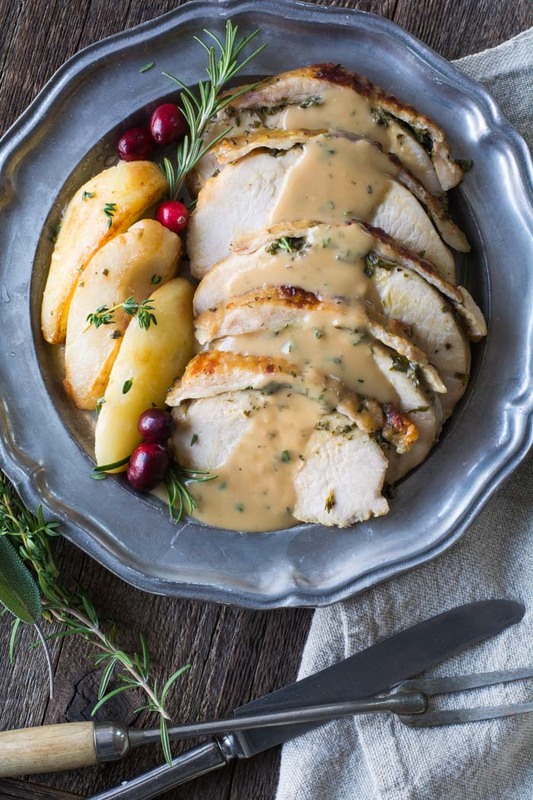 Slice turkey and serve with plenty of herb gravy and brown butter pears. Don’t forget to serve with plenty of Easy No-Cook Cranberry Apple Relish for the perfect bite. If you try and like this recipe please leave a comment and give the recipe a rating at the bottom of this page. Enjoy your Holiday season. 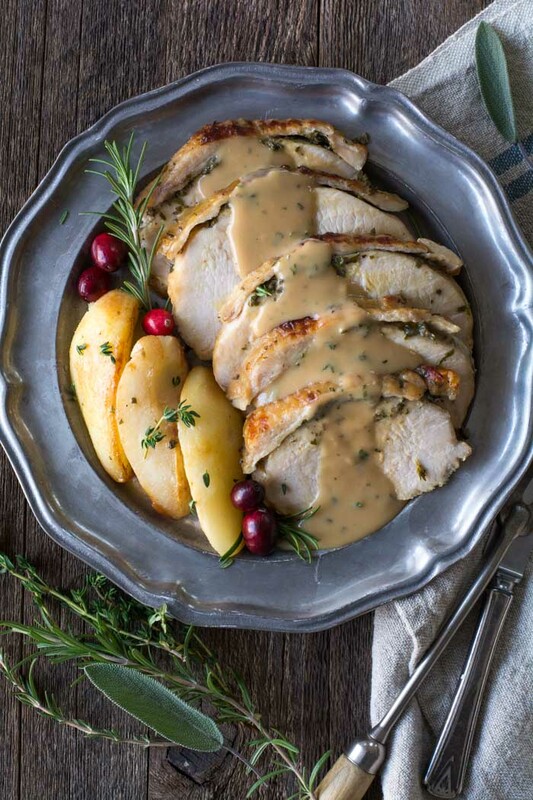 Slow cooked turkey breast with fresh herb butter, gravy and brown butter pears. 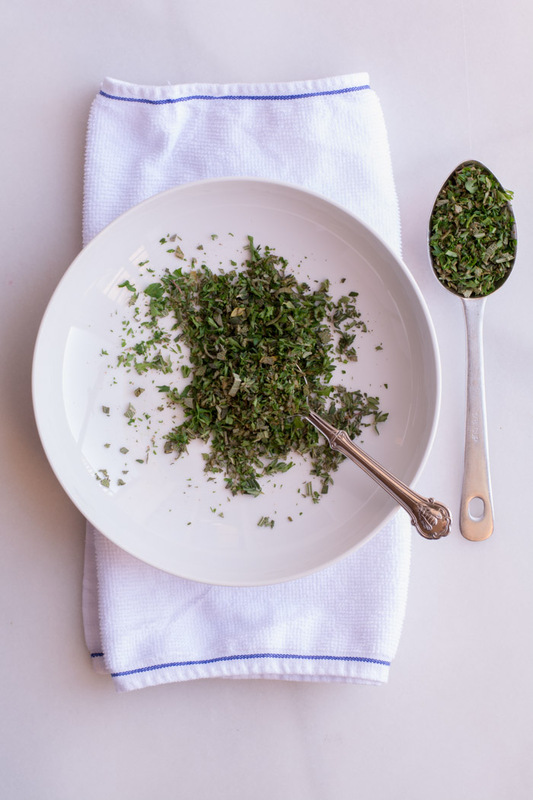 Chop fresh herbs and toss together with nutmeg. Reserve 2 tablespoons fresh herbs for gravy. 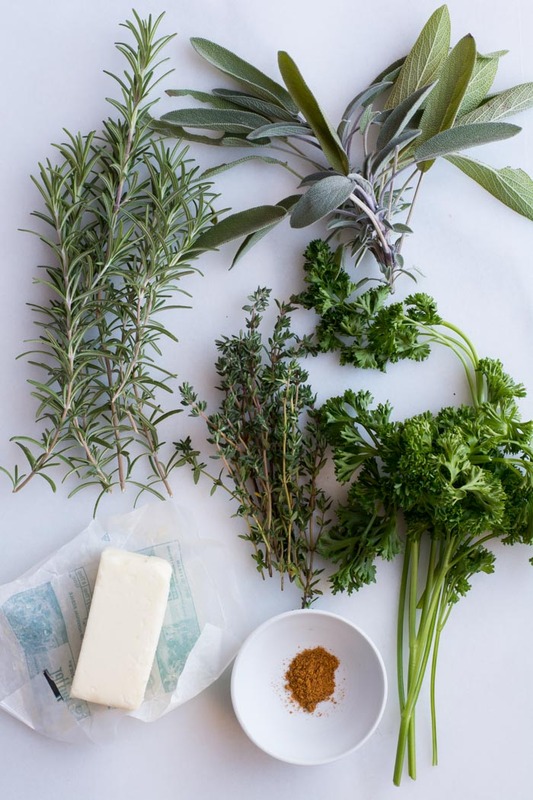 Blend fresh herbs with softened butter. 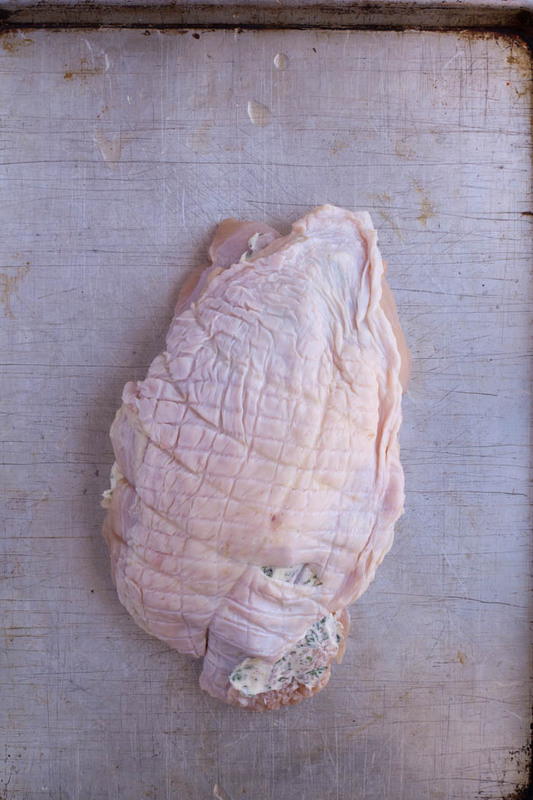 Carefully fold the skin of the turkey off of the breast meat. 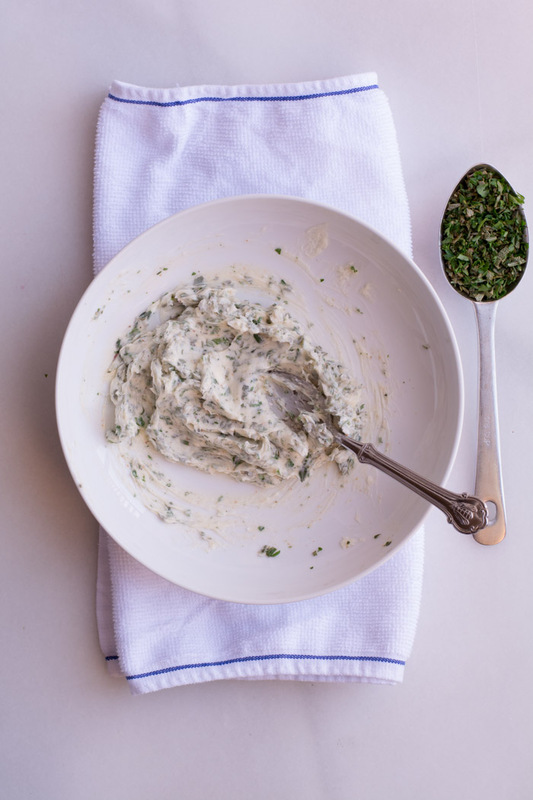 Spread with herb butter reserving 2 tablespoons. Lay skin back on top of the butter. Rub reserved butter over skin and bottom part of the breast. Season top with salt and pepper Tie with baking twine. Set aside. 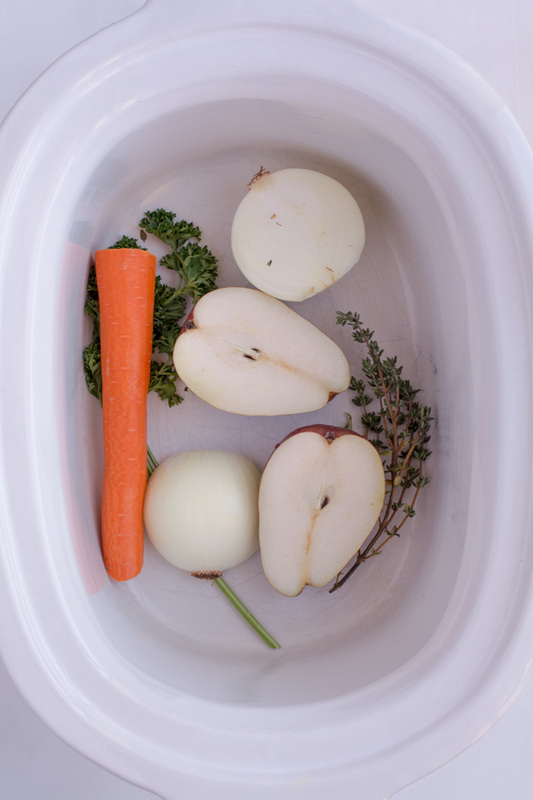 In the bottom of the crockpot arrange onion halves, pear halves, carrot, parsley, and thyme. Place turkey breast on top. 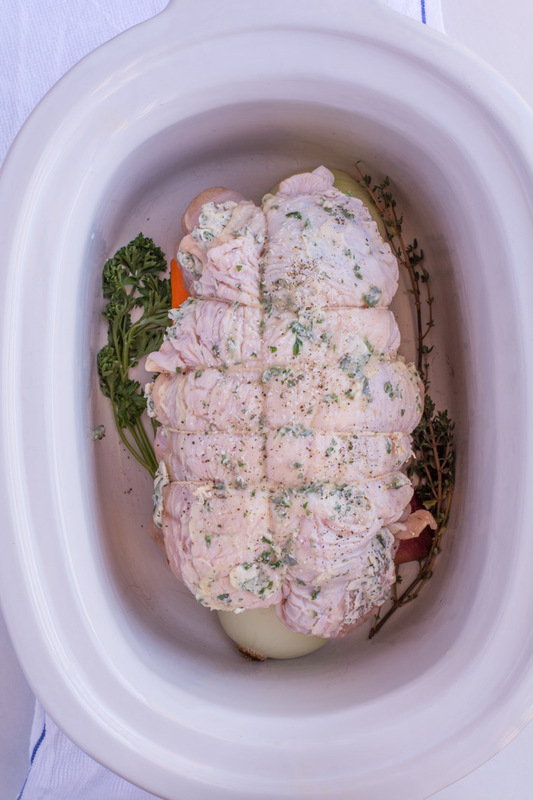 Cover with crockpot lid and cook on low heat for 5-6 hours or until internal temperature reaches 160-165 degrees F.
Remove from crockpot and place on a baking sheet. Allow turkey to rest at least 10 minutes before slicing. For crisp skin: Place turkey breast, skin side up, on a baking sheet under a broiler set on the lowest oven rack for 5 minutes. 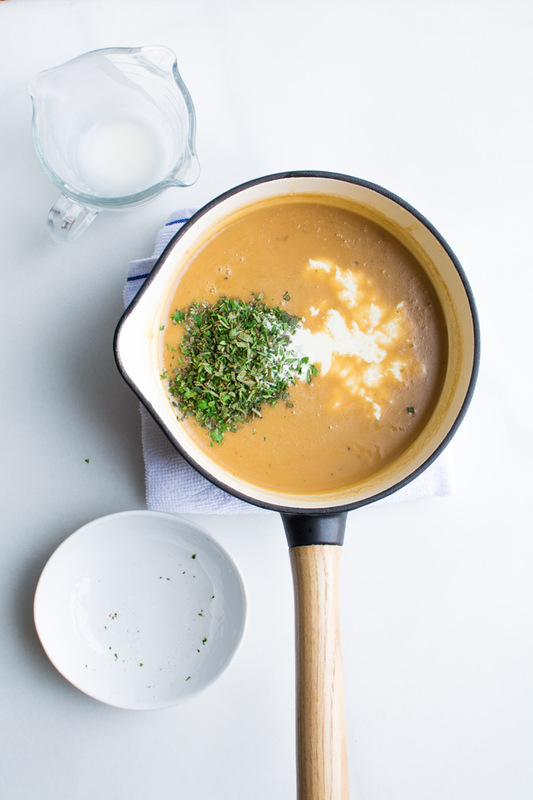 Serve with herb gravy and brown butter pears. In a saucepan add turkey stock and apple cider. Bring to a simmer and reduce liquid to 2 cups. Set aside until ready to make gravy. This can be done ahead of time. 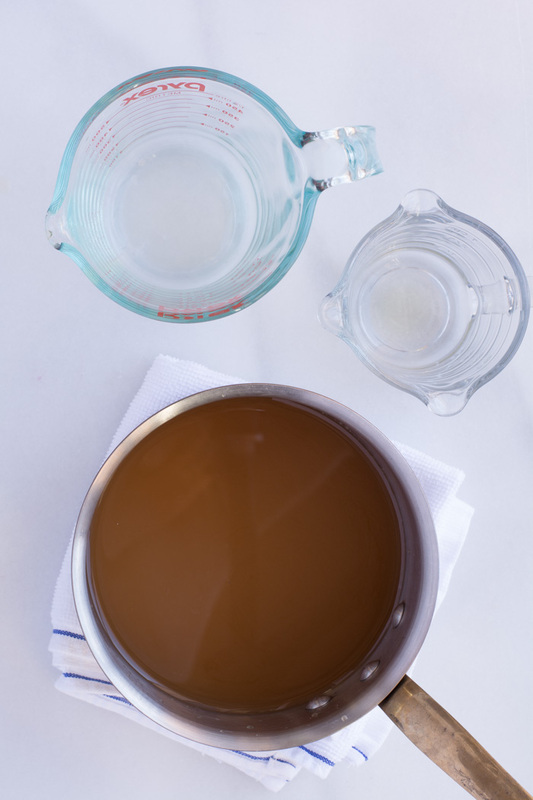 When ready to make gravy, drain solids from crockpot through a strainer. Discard solids and skim off any butter/fat. Combine juices and reserve stock/cider mixture and bring to a simmer. 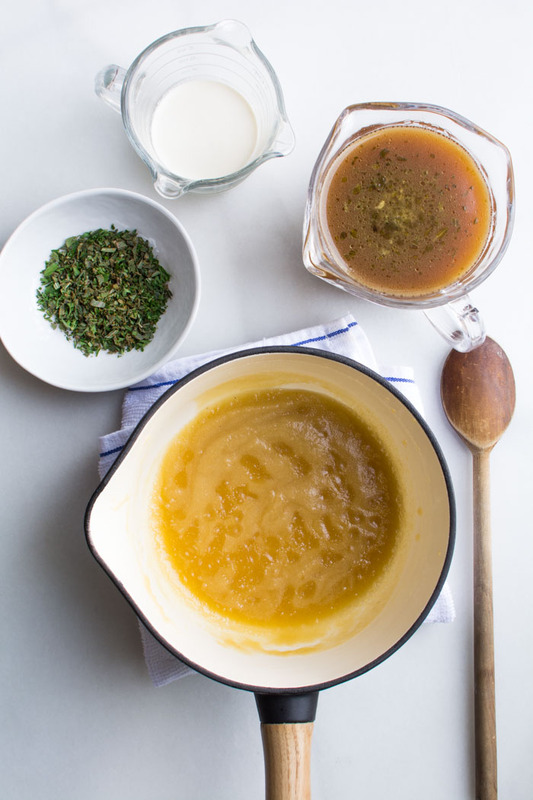 In a saucepan add 1/2 cup butter/fat mixture and flour to make a roux. Add hot stock and whisk constantly until gravy mixture is smooth. Add 2 tablespoons reserved herb mixture and 1/4 cream (optional). Peel and core pears. Cut into quarters. Melt butter in a large skillet. Add peeled and quartered pears. Saute until brown on all sides. Serve with turkey breast. 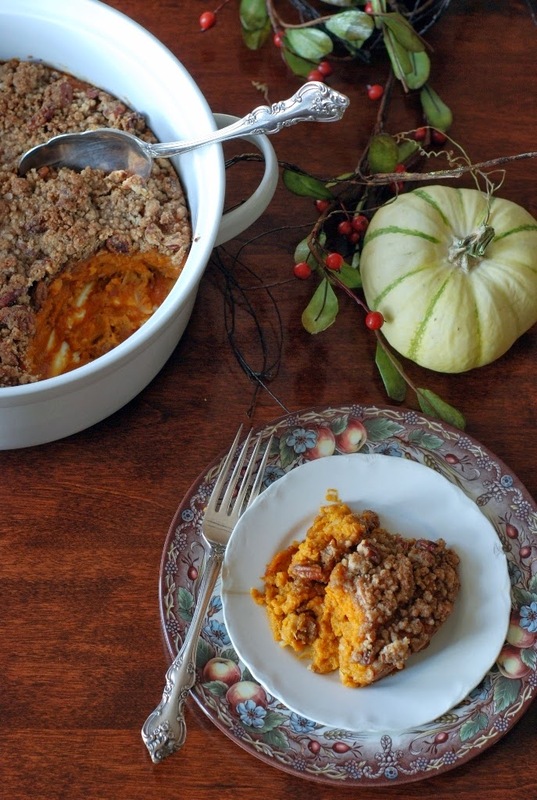 If you only make one of my recipes this year, make Southern yams. You’ll never regret it.